Background info: In each November/December issue, WildBird subscribers have the chance to crown one of their peers as Birder of the Year. The candidates appear as Forum Birders and Backyard Birders in each of the previous five issues. The contest is open to everyone who responds to the questions posed in the Birder’s Back Yard and Lister’s Forum departments in every issue. 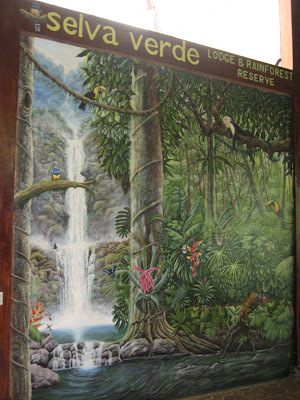 As 2008 Birder of the Year, Connie Kogler of Loveland, Colo., received a Swarovski 8x32 EL binocular and an expenses-paid five-day trip for two to Costa Rica with Swarovski and WildBird hosts. She also received a Swarovski squall jacket as well as “The Songs of Wild Birds” by Lang Elliott and the fifth edition of “Peterson Field Guide to Birds of North America,” provided by Houghton Mifflin. Connie, her husband Al, Clay Taylor of Swarovski Optik and I flew to Costa Rica in early June to bird for four days with Clay's Costa Rican colleague, Alex Villegas. Aided by our driver, Rafael, we covered a fair bit of ground starting on June 10. 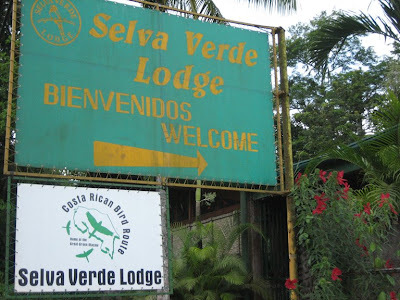 After our successful outing with Alex Martinez to find Great Green Macaws, we climbed into the trusty Kia Bongo III and drove toward Chilamate, site of Selva Verde Lodge & Rainforest Reserve next to Rio Sarapiqui. See the white sign for the Costa Rican Bird Route? It's a relatively new venture -- a collaboration between Corredor Biologico San Juan-La Selva, U.S. 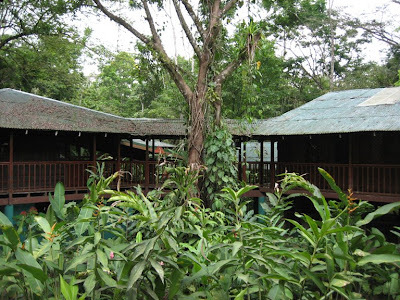 Fish & Wildlife Service and Rainforest Biodiversity Group -- that connects 12 sites, six long-established lodges/biological stations and six newer reserves owned by local landowners. 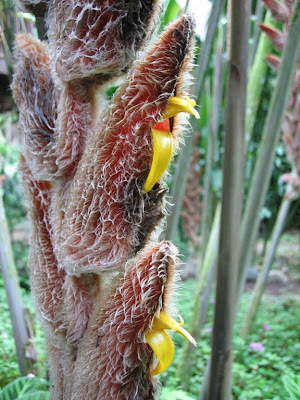 and interesting heliconia species like this: Heliconia vellerigera, common name "she kong." That looks kinda surreal, no? 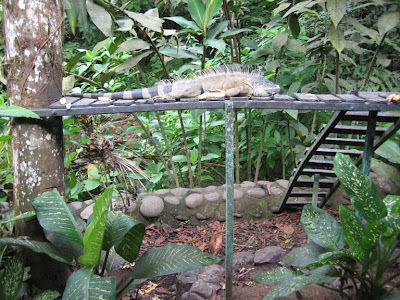 We also passed a lounging iguana or two. It doesn't look like it's going anywhere, does it? Maybe it ate a few too many bananas. I got such a kick out of the room key. 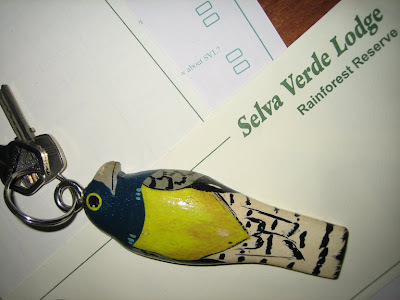 How often do you get to carry a Violaceous Trogon in your pocket? We ate a tasty and filling buffet lunch at the lodge's restaurant, joined by Andrea Holbrook, whose family created the lodge in the mid-1980s. She introduced us to Andrew Rothman, director of Sarapiqui Conservation Learning Center, and Raquel Gomez Ramirez, Costa Rican Bird Route coordinator. We enjoyed a lovely chat and spied some howler monkeys across the river before leaving the center to continue our quest for more avian delights. Wonder how many of those key chains they have to replace in a year! Birdseed tax to help wildlife habitat?